In my previous postings It Pays to Go Green and 5-Star Appliances and Rebates for You, I mentioned rebates of up to RM200 for energy-efficient appliances. For the time being these rebates are for air-conditioners and refrigerators with 5-Star labels. 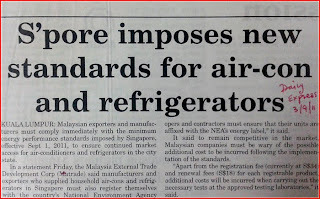 This is one of the steps taken by Malaysia government towards wider usage of household appliances with high efficiency. For Malaysia, energy-efficient equipment requirement is voluntary. Singapore is a step further. 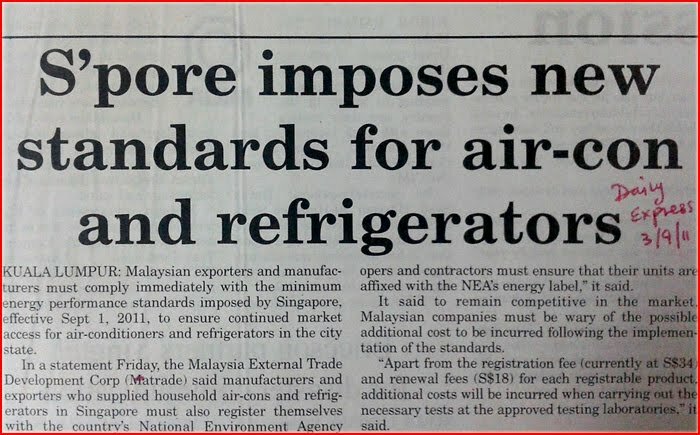 The city state has imposed standards for minimum energy performance (MEPS) and it is now mandatory for exporters and manufacturers, including Malaysia, to comply with new standards if they want to continue selling these products there. Among the specifications in these standards are types of goods, cooling capacity (in kW), minimum coefficient of performance, adjusted volume and maximum annual energy consumption (in kW). Higher production cost, product differentiation between export quality and 'local use'. Expect lower efficiency for local market. Remember, our carrots (rebates) are based on voluntary participation from manufacturers. Accelerated acceptance of green technology. Manufacturers will now have to innovate to produce goods that are more efficient but cheaper in order to stay competitive. Malaysia will have to come up with MEPS sooner than later. This should fulfill the government's pledge to reduce carbon emission. My opinion: Incentives are good, it helps in many instances and no doubt it can spur the advancement of green technology on to certain feel-good level. But couple with regulatory measures, the pace of such growth will certainly be better. Read about the imposition of new standards here.